VickeryHill co-owner Steve Butcher and his wife Carrie vacation in the Virgin Islands twice a year to spend time on their favorite beaches on and around St. John. A few years ago they met Jimmy & Bridgett Key, owners of Palm Tree Charters, and found out that the Keys and Carrie Butcher hailed from the same county in Tennessee. A friendship formed and talk of their St. John boat charter business came up. When the Keys bought the business in 2014, they inherited a basic 4 page ‘stiff’ website from the previous owners and, while the charter business was going well, they knew they had to step it up a notch to capture more and better quality visitors as well as improve the booking process. 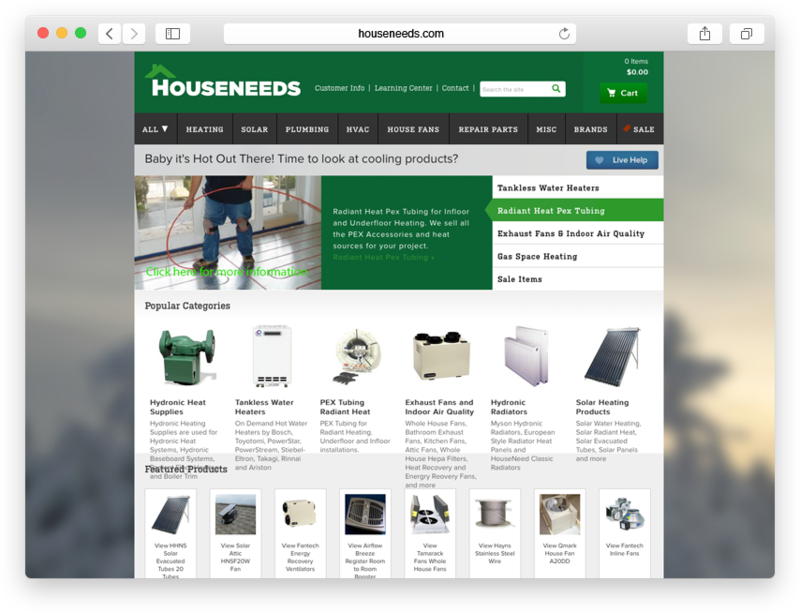 Their old site was a flat (non-content managed) site hosted on Network Solutions with an antiquated separate mobile cookie-cutter site redirecting visitors to the mobile content by reading the screen size. 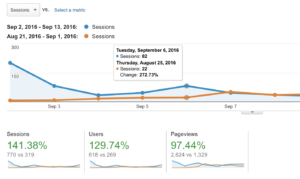 Visitor tracking (analytics) only worked on the desktop site which meant all data from the ever increasing smartphone traffic was lost. 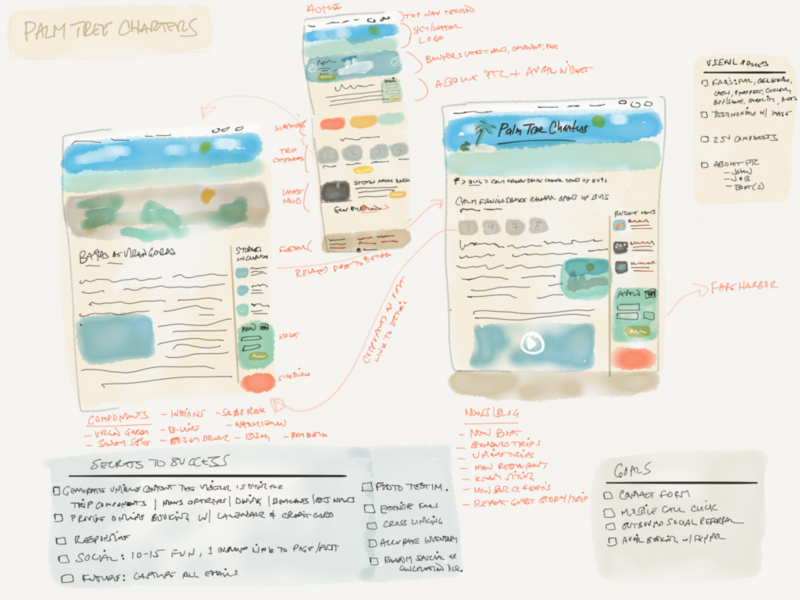 The mobile site looked completely different and when content needed to be updated, you had to manually do it in both places via text editor and FTP. Before casting off on the journey to a new site, we asked Jimmy & Bridgett what their goals were for the new site. Early on in the process, we figured out that the missing components on their (and most destination boat charter sites) website was the ability to see and dream about your future charter. Sure, day charter companies like Palm Tree Charters talked about how great they were and even linked to TripAdvisor reviews, but custom day charters in the Virgin Islands have dozens and dozens of destinations to choose from. Considering 3-5 stops during the day, this left literally millions of possible ‘trips’ to design for your 8 hours on the water. Their motto was You Choose the Cruise™, but a newbie to the concept of day charters in the Virgin Islands would have no idea where to go. Our plan was to configure a dataset of 50-75+ Virgin Island Destinations (with photos, text, Lat/Lon) with ties to one or more Activities (snorkeling, shopping, swimming, eating, drinking, dancing, etc). Visitors to the site can learn all about the places they can direct their cruise. The destinations are then associated with the dozens of Islands, which are themselves tied to their country (USVI or BVI). a St. Thomas cruise ship excursion for those people who are in St. Thomas port for only one day and want to see St. John without wasting hours ferrying and taxing around the island. The “Best of the BVI’s” which leads you to world-class snorkeling around Norman Island and an end-of-day stop at the famous Soggy Dollar Bar. 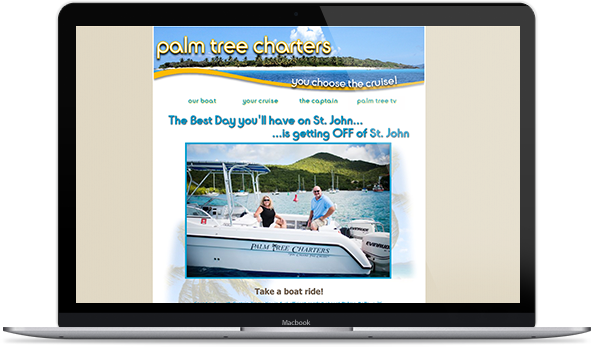 By building the site on the WordPress framework, we handed over the ability to edit most of the website’s content to the Palm Tree Charter’s owners. Since they are on the water every day, with high-quality smartphone cameras in their hands, we figured the best thing would be to let them develop new destinations and define new trip suggestions while they were out on the water every day. Jimmy & Bridgett use their iPhones to capture the beauty of the Caribbean while out on charter, create new trip concepts and even setup new activities as they come up. The charter destinations display on an interactive Google Map, are tied to activities and trip suggestions and all of this content is smartly coded to share well on Tweets, Facebook posts and other social media networks. 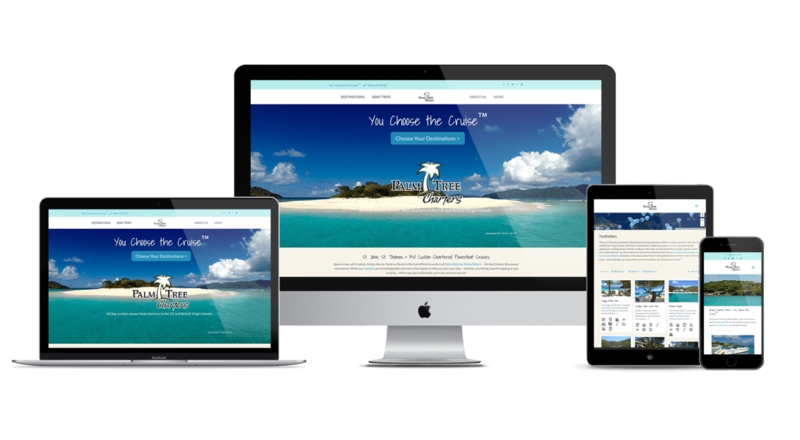 Before working on this new site, Palm Tree Charters (PTC) had a POP email setup on their mobile devices and desktop/laptops back on land. The website had a simple mailto link that we avoid like malware. Not only do the simple mailto links broadcast your email to every evil Spam Bot on the planet, they are difficult to accurately track, and leave the opening content. Emails would get lost, they could not tell what referrer or marketing investment brought in the lead, and would end up emailing back and forth multiple times to get the necessary information needed to book a charter. 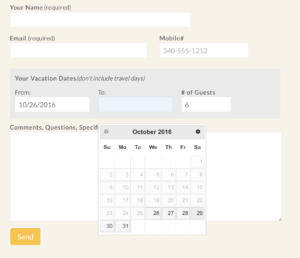 We created a form that asked for email address and mobile number as well as vacation dates and number of guests. Form submissions get stored in a mySQL database AND emailed to PTC. 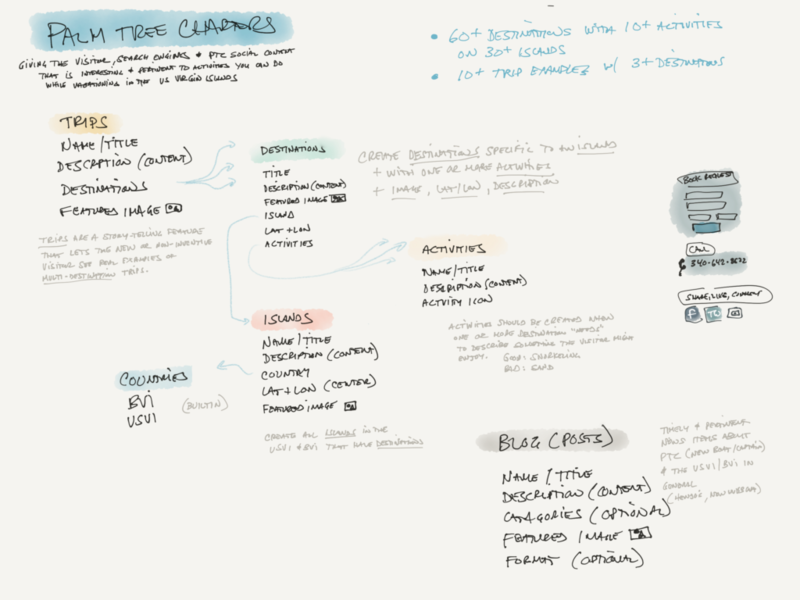 We then edited a set of html draft email responses with pertinent initial content that also hyperlinks to various FAQ, Destination, and Trip details on the website. Potential customers fill out the form and the Keys paste draft emails into the response. The guests learn details and are trained to return to the website for more answers – making the effort and time to booking even less. 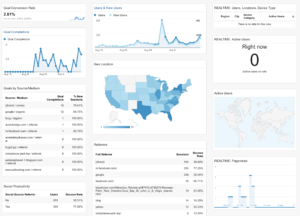 Within their Analytics accounts, we have integrated to Google Search Console to bring in organic query data and have created a custom dashboard for the dimensions and metrics that help the Keys keep track of how the site is performing. The old site had only 4 pages and only a few paragraphs of content, so it is easy to imagine it will do much better for pertinent keywords with search engines. But the new content-rich site should also excel by allowing for contextual linkage between various Caribbean destinations, islands, activities, and trips. 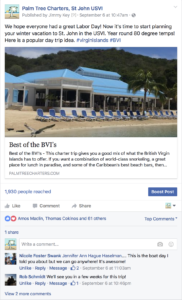 The site is completely indexed with Google and has risen in ranking for organic searches when people search for them by name or concept (St John boat charters, usvi charter boats, etc.). Traffic is up significantly, visitors are reading the destinations and trip suggestions, submitting contact forms and booking trips. Jimmy & Bridgett are more productive while out on the water (or even off-island) and use their mobile devices to do most of the work, including drafting new content. Fans of their Facebook page are tagging their vacation group people or friends and we’re tracking the sources the booking visitors are coming from – which will help make decisions on time spent and money invested. Leads are filling out request forms with arrival/departure dates and even naming ‘Trips‘ they would like to go on. Booked guests are being directed to online charter destinations and FAQs – saving everyone time and informing the customer before they arrive for their charter. The referred visitors are reading more pages, bouncing less, filling out booking forms, and referring their friends. Life in the islands just got better for all involved.